Child support or child maintenance is the ongoing obligation for a periodic payment made by a non-custodial parent to a custodial parent, caregiver or guardian, for the care and support of children of a relationship or marriage that has been terminated. In family law, child support is often arranged as part of a divorce, marital separation, dissolution, annulment, determination of parentage or dissolution of a civil union and may supplement alimony (spousal support) arrangements. While child support laws vary, the basic principle is that children are the responsibility of their parents, even when the family is no longer an intact unit. Both parents are still responsible to raise their offspring, even if they do not live together. Child support is thus a legal attempt to ensure that children receive the support they require to grow to adulthood. While economic support is essential, and provides many of the material necessities of life, children also require the loving care of parents to nurture their emotional and psychological development. Unfortunately, such support cannot be imposed by law, and many children receive the mandated child support but lack the love and security that they need to grow up to be healthy adults. Child support is based on the policy that parents are obligated to pay for the support of their children, even when the children are not living with both biological parents. In cases where the marriage is terminated, one parent is often awarded custody and the role of primary caregiver, though courts typically permit visitation rights to non-custodial parents. In such cases, the non-custodial parent still remains obligated to pay a proportion of the costs involved in raising the child. Child support may also be ordered to be paid by one parent to another when both parents are custodial parents and they share the child raising responsibilities. In rare cases, a parent with sole custody of his or her children may be ordered to pay child support to the noncustodial parent to support the children while they are in the care of that parent. These costs are still legally obligatory, even when the paying parent has been legally limited or prevented by the other parent from participating in or making decisions involving the upbringing of the child or children. It is also important to note that the custodial parent is expected to pay a percentage of the costs incurred raising a child, even if the non-custodial parent has been ordered to make child support payments. In Massachusetts, for example, it is the responsibility of the custodial parent alone to pay the first $100 per year in all uninsured medical costs for each child. Only then will the courts consider authorizing child support money from a non-custodial parent to be used for said costs. In most jurisdictions there is no need for the parents to be married, and only paternity and/or maternity (filiation) need be demonstrated for a child support obligation to be found by a competent court. Child support may also operate through the principle of estoppel. In many states the principle of estoppel can be used to require a person to pay child support even if the assumption of a parental relationship was the result of a fraudulent misrepresentation of paternity by the mother. Child support laws vary around the world. Some jurisdictions sort the arrangements out directly between the parents. Others involve the state collecting child support payments as though it were a tax. Child support in Japan has been lower than that in Europe or America, with the amount arrived at via direct negotiation between the custodial and non-custodial parent. Under Enforcement also varies across countries. Egyptian law, men who do not pay child support within thirty days of a court decision are subject to arrest. In the United States some non-custodial parents claim there is no accountability on the part of the custodial parent regarding how child support payments are spent and accuse the custodial parent of spending support money on non-child related expenses. Depending on the jurisdiction, a custodial parent might legally be required to account for how child support money is spent. In the United States, ten states (Colorado, Delaware, Florida, Indiana, Louisiana, Missouri, Nebraska, Oklahoma, Oregon, and Washington) allow courts to demand an accounting from custodial parent on how child support dollars are spent. Additionally, Alabama courts have authorized such accounting under certain specific circumstances. Despite this, some non-custodial parents in such situations still view their only recourse to lie in petitioning the court for a change of custody. In very few jurisdictions the privilege of visitation (or access) is tied to child support. If the custodial parent refuses to allow the non-custodial parent visitation with the child, the non-custodial parent can petition the court to temporarily stop support payments. In most jurisdictions the two rights and obligations are completely separate and individually enforceable. This is because the withholding of support is seen as punishing the child, not the parent, and in such cases the court may order additional visitation to the non-custodial parent. Courts have held that it is acceptable for child support payments to be used to indirectly benefit the custodial parent. For example, child support monies may be used to heat the child's residence, even if this means that other people also benefit from living in a heated home. U.S. court order issued by family division of county court garnishing typically the father's income. There are two approaches to calculating legal child support award amounts. One, based on the costs of supporting a child, the other related to the capacity of parents to contribute to the support. In the United States, the federal government requires all states to have guideline calculations that can be verified and certified. These are usually computer programs based upon certain financial information including, earnings, visitation, taxes, insurance costs, and several other factors. In most states existing child support orders are reviewed once every three years to see if modifications or adjustments in payment amounts are necessary. Child support modifications can also be requested at any time by either the custodial or the non-custodial parent. If a non-custodial parent loses his or her job or experiences financial hardship, he or she can request to have the amount of the child support payments reduced. Conversely, if the non-custodial parent's salary or income increases, or if the child's personal expenses increase, the custodial parent can request modifications to increase the child support payments. Modifications are performed and executed depending on the lifestyle of either parent. Child support is paid by the noncustodial parent to ensure that their children have what they need to live a comfortable life. Child support laws and enforcement differ from state to state, but in all regions and jurisdictions, non-custodial parents must pay according to the court's child support order or face legal consequences. Some parents also have informal or voluntary agreements or arrangements that do not involve the courts, where financial child support or other non-cash support is provided by non-custodial parents to assist in supporting their child(ren). In divorce cases, child support payments may be determined as part of the divorce settlement, along with other issues, such as alimony, custody, and visitation. In other cases, there are several steps that must be undertaken to receive court-ordered child support. Some custodial parents may hire lawyers to oversee their child support cases for them; others may file their own applications in their local courthouses. The custodial parent, or his or her attorney, must file an application to have the child support case heard by the court. The applications vary from state to state, but generally collect identifying information about both the custodial and non-custodial parents and include a court fee. If a non-custodial parent denies fathering the child, or if he is not listed on the child's birth certificate, the court will order a paternity test to establish paternity before proceeding with the child support hearing. Once the identity of the father is confirmed through DNA testing, the child's birth certificate may be amended to include the father's name. The father may also acknowledge paternity by signing a statutory declaration of acknowledgment form. After the responsibility for child support is established and questions of paternity have been answered to the court's satisfaction, the court will order the non-custodial parent to make timely child support payments. In addition to monetary payments, non-custodial parents may be ordered to add their children to their health insurance plans. In some states both parents are responsible for providing medical insurance for the child/children. If a non-custodial parent is ordered to pay health benefits for the child/children, it will automatically be garnished from their wages. The age at which child support payments end differs by court order and by state. In some jurisdictions, payments may cease when the child turns 18 or graduates from high school, whichever happens last. In other states, or under other court orders, non-custodial parents may be responsible for payments until the age of 19 or 21. Many American universities also consider non-custodial parents to be partially responsible for paying college costs, and will consider their income in their financial aid determinations. In certain states, non-custodial parents may be ordered by the court to assist with these expenses. If the non-custodial parent owes back child support, he or she must continue to make payments until the debt is satisfied, regardless of the age of the child. If a child seeks legal emancipation support may be terminated. Child support agencies typically describe clients as being in compliance, not in compliance or criminally non compliant. Compliance is judged by the paying party's performance in meeting the terms of the legal child support court order. Non-custodial parents who avoid their child support obligations are often termed dead-beat parents. While "dead-beat" is a descriptive term used often in the media and by child support advocacy groups, it is not the legal term used to describe non-paying parents. The US Department of Health and Human Services estimates that 68 percent of child support cases had arrears owed in 2003 (a figure up from 53 percent in 1999). Many of these arrearage cases are due to administrative practices such as imputing income to parents where it does not exist and issuing default orders of support. According to one study, 38 percent of Illinois non-custodial parents not paying child-support said they lacked the money to pay. If the non-custodial parent refuses to remit the court-ordered child support payments, the court may take one or several different actions. Non-payment of child support can result in wage or tax refund garnishment, suspension of drivers', professional and recreational licenses, inability to apply for or renew a U.S. passport, and, sometimes, federal prosecution. A major impetus to collection of child support in many places is recovery of welfare expenditure. A resident or custodial parent receiving public assistance, as in the US Temporary Assistance for Needy Families (TANF), is required to assign his or her right to child support to the Department of Welfare before cash assistance is received. Another common requirement of welfare benefits in some jurisdictions is that the custodial parent must pursue child support from the non-custodial parent. 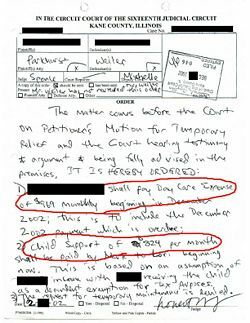 ↑ Child Support Enforcement Retrieved February 20, 2008. ↑ Child Birth and Child Support in Japan, Japan Children's Rights Network. Retrieved February 20, 2008. ↑ Egypt: Divorced from Justice, Human Rights Watch. Retrieved February 20, 2008. ↑ Divorce and Financial Aid Retrieved February 20, 2008. ↑ Child Support Enforcement FY 2003 Preliminary Data Report, Administration for Children and Families. Retrieved February 20, 2008. ↑ Child Support Report, Administration for Children and Families. Retrieved February 20, 2008. Child Support Agency Australia 2006. Child Support Schemes: Australia and Comparisons 2006. Retrieved February 20, 2008. Personal Responsibility and Work Opportunity Reconciliation Act (PRWORA). 42 U.S.Code §602a (1) and (2). This page was last modified on 11 February 2017, at 15:54.